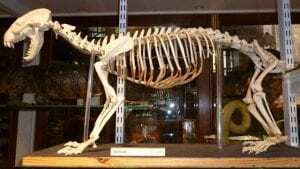 The various mustelids that make up the badger grouping share a single feature of being built like a “unit” (according to Grant Museum of Zoology Manger Jack Ashby), with their short legs and wide body which make them brilliantly adapted to digging their homes (called “sets”). 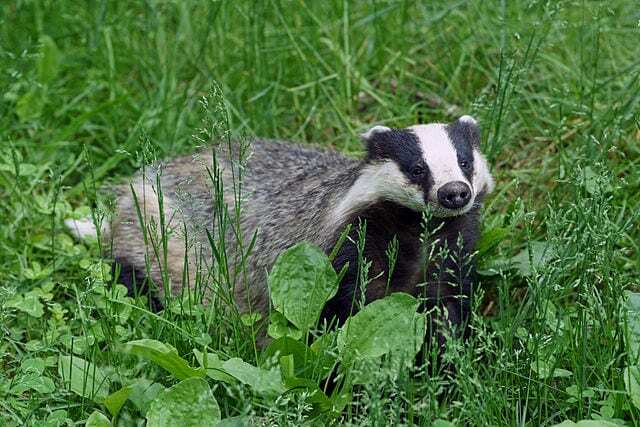 Badgers are made up of 11 species in total, including arguably one of the most ferocious mammals on Earth, the honey badger (Mellivora capensis). This species (weighing between just 9-16kg) has been known to take on a lion when cornered. A lion! The ferocity of honey badgers went viral with over 81 million views on Youtube in this clip (due to natural history content of course, nothing to do with the narration). Warning, this is definitely a 12a rating . Our specimen, the Eurasian badger (Meles meles), has by far a much friendly reputation. 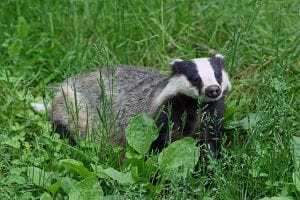 Despite being the UK’s largest carnivoran, the Eurasian badger is one of the best loved animals in Britain. Eurasian badgers can be found right the way from UK and Ireland all the way across Europe into the Middle East. Top of list on the menu for these nocturnal mammals are worms, which can make up 60 per cent of their diet, with adults eating well over 200 worms in a single night. These opportunistic omnivores will eat anything from crane fly larvae, ground nesting birds, nuts, seashore molluscs and even formented soft fruit (leading to apparently drunken badger behaviour). If you fancied some badger watching you’re in luck. The Badger Trust give some excellent advice on how to go ‘badger watching‘. The Badger Trust also has a network of local groups spread across the country who run organised badger watching trips, you can find your nearest one here. Despite being protected under UK law since 1992, the Government in England decided in 2013 to trial the use of targeted culling of badgers in the hope to control the transmission of tuberculosis in cows. This trial, beginning in west Gloucestershire and west Somerset, was rolled out further in 2015. Bovine TB is unarguably a terrible disease in cattle that genuinely effects the livelihood of farmers, but is culling the answer? It would seem not, according the Government’s own scientific advisers a cull would actually make the problem of TB transmission worse, but still it continues today (post-expert world perhaps?). 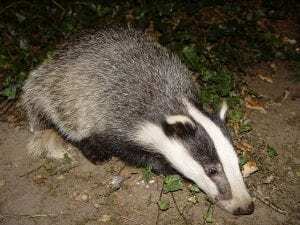 I would heartily recommend you checking out ZSL’s Rosie Woodroffe’s blog, which is a brilliant review of the evidence of the cull and the potential other methods to control the spread of TB.